Orange County’s Convention Center and the world famous International Drive are on the verge of a Renaissance. The second largest convention facility in America, the Convention Center drew roughly 1.3 million attendees last year, contributing approximately $2.1 billion in economic impact to Central Florida’s economy. With the $187 million capital improvement project underway at the Convention Center and by investing in roadways, infrastructure, transportation connectivity and pedestrian projects that enhance the quality of life for citizens and visitors, the region is securing a dynamic future for generations to come. The County is leading to work on the creation of a revitalized vision for the I-Drive tourism district, which will showcase new dynamic spaces, including pedestrian plazas, dedicated transit lanes and sidewalk enhancements for local residents and guests to enjoy. Located in the heart of the I-Drive tourist district is the I-Drive 360 complex, which is home to the Orlando Eye observation wheel; Madame Tussaud’s, an immersive and interactive wax experience; SEA LIFE Orlando Aquarium and a blend of attractions, restaurants, clubs and shops. Situated in the shadow of the impressive Orlando Eye observation wheel, the newest addition is Shake Shack, a critically acclaimed, modern day “roadside” burger stand known for its 100 percent all-natural Angus beef burgers, griddled-crisp flat-top dogs, fresh-made frozen custard, crinkle cut fries, craft beer and wine, and more. A fun, lively, fine-casual restaurant with widespread appeal, over the past decade Shake Shack has earned a cult-like following around the world. In addition to all of the classic Shake Shack menu items, the I-Drive Shack will be spinning up two location-specific frozen custard concretes: Orlandough (chocolate frozen custard, chocolate truffle cookie dough, marshmallow sauce and chocolate covered pretzels) and Eye Drive (vanilla frozen custard, peanut butter sauce, chocolate toffee and chocolate sprinkles). The Key Lime Pie oh My (vanilla frozen custard blended with a slice of key lime pie from local Orlando bakery P is for Pie), a fan favorite from the Miami Beach location, will be available as well. 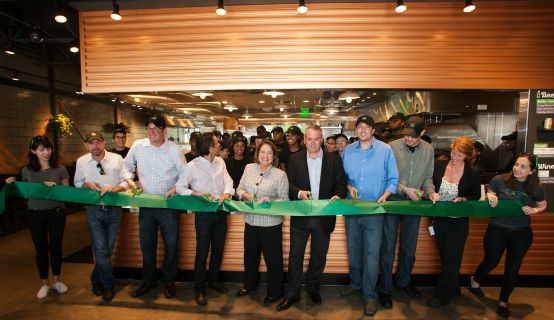 Photos from the Shake Shack I-Drive grand opening are available on Flickr for the media.